This booklet is only a tabulation of some facts I have gathered concerning our churches and our community. I enjoy working on genealogy and family history, both of which are an integral part of what our lives are now. Plantersville Baptist Church and the other churches in our community were important to people before us and need to be an important part of our lives and our community. The facts herein are taken from papers written by people who were part of this community, and may or may not be totally factual. The names on the membership lists may or may not contain all the names of every member of the church. Omission of names or facts is purely accidental. I would appreciate any other information that can be added. Preservation of old photos and newspaper articles is now easier than ever with the use of computers. The problems I have found is that many old photos have no names and other artifacts are in poor condition when someone decides that they want to preserve them. Many times all the ones who might remember the pictures or the happenings of the past, are no longer able to tell us what they know. We as a society are so busy; we do not have time for the past until it is too late. One common thread in the generation before us is the love of God, family and country. Most all of the member of the community were involved in the Church, they believed in loving their neighbors, and exhibited their faith in God. They took time to read their Bibles, not watch TV. They worked hard for a living, not expecting handouts. They prayed diligently. They did not know about HIV, or a president who broke the commandments or terrorists who would deliberately cause a plane to fly into a building. We have much more to contend with, but God’s message is the same. Jesus Christ died for our sins and arose to the Glory of God. All God asks for is that we believe and accept Jesus into our lives. He gave us a simple plan that applies to all ages of time. The community now known as Plantersville was first called Corinth. It was located on the banks of Big Mulberry Creek, on an Indian trail leading from Huntsville to Cahaba. The area was a favorite hunting and fishing ground for the Indians. Many arrowheads have been uncovered by the white man’s plow, giving us a reminder of the earliest inhabitants. One of the first settlers is known to have built on land deeded by the government in 1774. As more and more planters moved in to cultivate the wilderness, Corinth became the center where they came together for horse racing, horse-trading, and socializing. When Alabama became a state in 1819, the inhabitants renamed their township to Plantersville, to denote the chief vocation of the people. There are two houses still standing that reflect the affluence of the planter class. These fine examples of antebellum architecture are the Todd House, (see footnote) built in 1859 by Dr. Samuel G. Todd, a dentist who had moved to Alabama from Maryland, now rental property owned by Henry Biscoe; and the Driskell House, built by the Virginia slave holder, Thomas S. Driskell, in 1850, and now owned by Robert and Betty Martin. The Driskell House features a solid mahogany staircase ascending to the second floor from the 15-foot-wide front hall. The open fretwork adorning the ceilings in the dining room and parlor were created by a young French artisan traveling through the area. Thomas Driskell besides being a planter, was the first merchant in Plantersville. He obtained the merchandise for his store by making an annual trip on horseback to South Carolina. The supplies he ordered there were then shipped by boat down the Atlantic Coast around to the Gulf of Mobile and up the Alabama River to Selma. From Selma they were loaded onto wagons for transport to Plantersville. In the closing days of the Civil War, as General James H. Wilson advanced on Selma, with the purpose of knocking out this important center of munitions and supply to the Confederacy, Mr. Driskell, his wife, their two sons: Will and Tom, and their three daughters became forced hosts to General Wilson. General Wilson made his headquarters in an upstairs bedroom and for this reason the house was saved. Driskell’s store, cotton gin containing 63 bales of cotton, and warehouse were burned to the ground by the Union Army. The church building built in 1850 on land donated by Mrs. Driskell, was home to Methodist, Baptists and Presbyterian congregations. The building served briefly as a hospital for Union soldiers, one of whom is buried in the adjoining cemetery. The old frame church was struck by lightning and burned on May 10, 1922. The present Methodist Church was built on the same site in 1929. The coming of the railroads signaled the end of the old era of the stagecoach inn, founded by Davis McGee, where travelers could stop over for food and lodging and horse traders from Tennessee could congregate to sell or swap their stock. As the years went by, there were other sign of change. A lumber company bought thousands of acres of virgin timber and did business in the area for a number of years. In 1881 a sawmill began operation in nearby Ridersville, the families of its employees swelling the number of children for whom schools were provided in Plantersville. Determination of the citizens to insure an educational opportunity for their young people never wavered despite difficulties. In the late 19th century Plantersville had its own college, founded by and chartered under John L. Dodson LL.D., who had formerly been president of Oxford College at Oxford, Alabama. Dallas County High School of Plantersville finally came into existence in 1909 and absorbed the facilities of Plantersville College. It is claimed that the Plantersville secondary school was the first public high school in the state. The school was financed by a $4000 grant from the state legislature and by $6000 in local contributions of money and labor. A permanent, continuous public elementary school was established soon afterward. Dallas County High School was the oldest public high school building in existence until fire destroyed the main building on April 19, 1982. Arson was suspected and many of the community mourned the loss of the building and also old records, trophies and other memorabilia. The school building was reopened by the fall of 1983 and restored to its original antebellum style architecture. The township of Plantersville proper comprises one section (one square mile) of Dallas County. By popular vote it is still unincorporated. Agriculture is largely in its orientation just as many years earlier it played a major role. Today the agriculture is in the form of greenhouse businesses, which produce bedding plants and timber trade made throughout the Southeast. Plantersville Baptist Church was begun in 1848, although some histories have stated 1852 or 1854, the corner stone in the present church has the earlier year. 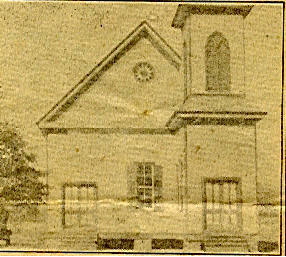 There was no building at the time of organization, so a plan was begun with the Methodists to build a house of worship. The Driskell family deeded a lot in the grove near the railroad station to the Baptists and Methodists together and the members of the two denominations erected a building. Later the Presbyterians bought a third interest in this church. All three denominations used the same structure and although the church was sometimes called “Union Church”, each one had their own pastors and congregations. Slaves held membership with the whites in the earliest days. The building had two doors in the front. The women entered in through the left-hand door and sat on left side of the church and the men entered through the right-hand door. A plank partition down the center of the middle row of benches kept the women and men separated in church. The right hand corner of the church was called the Amen Corner. When the Preacher would bear down, someone in that corner would say “Amen”. The number of “Amens” would determine how long the Pastor remained in that Church. There was no organ or musical instrument in those days. Members would lead in congressional singing. Plantersville Baptist Church is mentioned in the September 7, 1854 issue of “South Western Baptist” Newspaper, which is a forerunner of “The Alabama Baptist”. “At Plantersville, twenty miles above Selma, on the S.R. & D.R.R., the first Baptist sermon ever heard was preached (1852) in a school house occupied regularly by Universalists. The building of a house for worship, by the community, was soon projected on the partial completion of which a small number of Baptists were organized into a church. The Methodist brethren were organized also. Year after year a gracious revival succeeded another, and each denomination was strong in numbers and means, and in faith and good works. The Lord was in Zion; since 1862, Breth. I.U. Wilkes, A. Andrews, H.E. Longcrier, and now Geo Mills, have served this church. In 1898 the Baptist Congregation began planning the first Baptist Church and in 1901 the Baptist congregation sold their interest in the building back to the Methodist for $80.00. A site on the line between Dallas and Chilton Counties was deeded to the church by Mrs. W.T. Coker. The Pastor at this time was the Rev. W.R. Connell. The church belonged to the Unity Association but joined the Selma Association in 1918. Miss Addie Estelle Cox organized the WMU about 1916; the first president was Mrs. J.E. Mattison. In 1948 Mr. and Mrs. W.C. Herrod, Sr. deeded a one-half acre lot adjacent to the church for a pastorium and a brick building valued at $14,000 was built in 1949. In 1950 a building fund for a new church building was begun. Rev. J. R. Robinson was serving as pastor on January 10, 1954 when the church membership voted to become a full-time church. In May 1955 after much discussion plans were made to move ahead with the construction. On Sunday November 14, 1955, a special ground breaking service was held at the church with Dr. A.H. Reid of Montgomery as guest speaker. After worship, the congregation assembled outside and the regular ground breaking service was conducted. Work of demolishing the old building began on November 15, 1955. Henry O. Houston was contractor for both the pastorium and the new church building. The first services were held in the new building on May 20, 1956 with 141 people in Sunday School. Work was finally completed in August 1956 at the cost of $42,000. A dedication service was held in the new building on April 7, 1957 with Dr. A.H. Reid, Executive Secretary of the Alabama State Convention as guest speaker. The first baptisms in the new baptistery were on August 12th, 1956, when twelve young people joined the church during revival. The first immersed by Brother Robinson was Sara Houston, daughter of Mr. and Mrs. Henry O. Houston. Deacons at the time of dedication of the new building were: O.H. Barnes, J.C. Baskin, John Herrod, C.C. Gay, Sr., W.H. Smitherman, Vincent Pierson, Watson Pierson, J.W. Friday and Henry Houston. For many years money had been set aside exclusively to be used for the construction of a Fellowship Hall. The dream became reality in 1992 when a committee was appointed and plans were drawn up. The new construction is connected to the old building and is 86’ X 31’ It includes three classrooms, a large kitchen with serving area, a Pastor’s office, two restrooms and a large fellowship area. 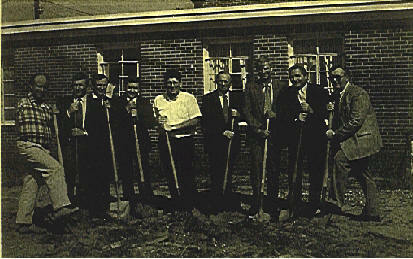 The ground-breaking ceremony was conducted on March 15, 1992 in conjunction with Mrs. Eula Mae Friday’s 90th birthday. Construction was done by Bruner Construction Company and many well-qualified volunteers. The building has been “paid in full” due to the financial support of members and friends of the church. Dedication services were held on Homecoming Day July 11, 1993. Recognition was made to all those who have made this new Fellowship Hall possible. On September 13, 1998 we are celebrating the one hundred and fifty-year anniversary of the church. Many hours of planning has gone into the ceremony, which will be led by the Deacons and members of Plantersville Baptist Church. An opening prayer will be led by Rev. Von McQueen, who has served as our interim pastor during the time we have been without a pastor. A presentation of a plaque will be made by Quentin Porch, a past commissioner of the Alabama Baptist Historical Commission. The morning message will be given by Dr. Billy Nutt, the Director of Associational and Cooperative Missions for the Alabama State Baptist Association. Dinner will be served pot-luck in the fellowship hall following the service. We will be welcoming a new pastor, Rev. Michael W. Golson and wife, Diana and are very much looking forward to this new time and both them and for us. To the many past and present members who have been a part of this church, may we thank you. Let us the present members all remember the importance of our past and not forget the past members’ perseverance and prayer. Footnote: The information here was incorrect in the original reference. The house is not the :"Dodd House" but the "Todd House" built by Samuel G. Todd in 1859. This was brought to my attention by a descendant of the Todd family.